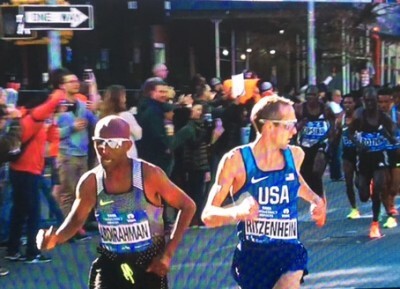 Dathan Ritzenhein, who led early, dropped out, as did defending champion Stanley Biwott. Entering the race, one of the major questions was how would Biwott and Ghebreslassie bounce back just 11 weeks after running the Olympic marathon (Biwott made it 35 kilometers before dropping out in Rio; Ghebreslassie was 4th). Today’s race provided definitive answers on both fronts: Biwott never looked comfortable and didn’t even make it 10 miles before dropping out with a calf problem, while Ghebreslassie was in total control throughout and stormed to a dominant 2:07:51 victory, the fifth-fastest time in course history. 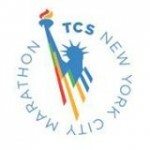 Ritzenhein and fellow American Matt Llano did most of the leading during the first half of the race, and Ritz was among a group of 12 men who passed 12 miles together. 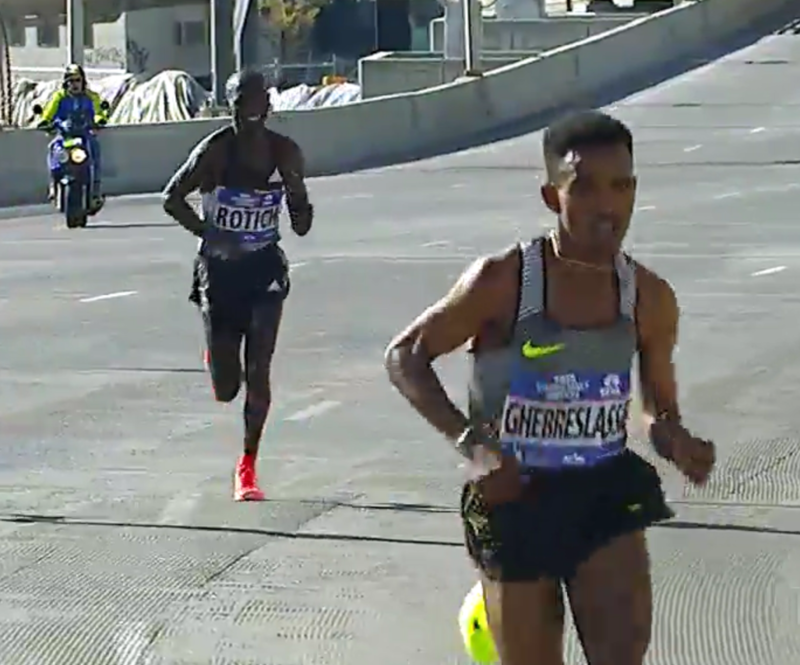 Just before halfway, Rotich made a move, but it served as more of a warning shot as Ghebreslassie and Desisa quickly countered it. Ghebreslassie then upped the ante and broke the race open with a brutal surge at the halfway mark (64:24), covering mile 14 in 4:33. Rotich and Desisa were the only ones who could respond, and by 14 miles Kipsiro, their closest competitor, was 13 seconds adrift. 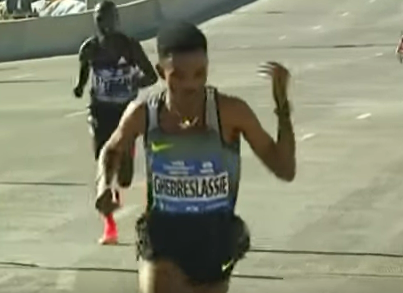 Those three men kept cranking (they covered 20-25k in 14:48) and remained together until Ghebreslassie began to pull away on the Willis Avenue Bridge at 20 miles. 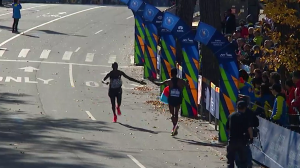 The pace actually slowed at that point (mile 20 was 4:48), but it was preceded by 4:35 and 4:39 miles back to back, which clearly took their toll on Rotich and Desisa. Desisa, wearing a pained expression, really began to struggle as soon as he fell back and wound up a DNF. Rotich was also hurting badly but hung tough over the final 10k to take second in 2:08:53, just over a minute behind Ghebreslassie. That left only Ghebreslassie, who showed no ill effects from Rio to become, at 20, the youngest ever NYC champ and the first Eritrean champ as well (American Meb Keflezighi who won in 2009 was born in Eritrea). With a shallow elite international field trimmed further after Biwott and Desisa’s DNFs, there was an opportunity for Americans to place highly and Abdi Abdirahman took full advantage, running a strong final four miles to take third in 2:11:23, his highest finish ever in a major. His time was the fourth-fastest by an American this year and the fastest in New York since Meb Keflezighi in 2011. Fellow American Shadrack Biwott ran the best marathon of his career to date, taking fifth in 2:12:01, a 54-second PR. Ghebreslassie has established himself as one of the world’s very best marathoners and this was the finest performance so far in his young career. Only five men in history have broken 2:08 in New York, and though the DNFs of Biwott and Desisa certainly helped Ghebreslassie, it would have taken something special to beat him today. Today’s result also makes Galen Rupp’s Olympic performance look even better, as he beat out Ghebreslassie for the bronze in Rio. Editor’s note: Description of the hand gesture edited and video added. Rotich and Ghebreslassie have a mini-rivalry and friendship growing with Rotich beating Ghebreslassie by 30 seconds in last year’s Hamburg marathon and Ghebreslassie turning the tables today. There was a nice gesture between them later in the race. After Ghebrsellasie won, he grabbed an Eritrean flag and ran back onto the course where Rotich was coming the other way to the finish. They gave each other a high five. 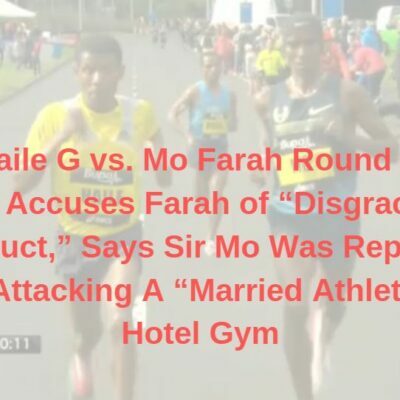 We can’t think of another sport where you would see something like that. Ghebreslassie said beforehand that the Rio Olympics did not take too much out of him as the pace was not very fast. After his victory today, he said he prefers faster paced races (which is curious as he was the World Champion in a race won in 2:12:27 without rabbits) and he helped insure this one was fast the second half. A key for Ghebreslassie is his confidence. “As we know, if you lose your confidence, you lose everything. What you did in training, also what you are going to do in the race, you can lose everything. So in order to be — in order to achieve what you need during the race and before, you must have full confidence. If you lose your confidence means you are hopeless. If you lose your hope, you can’t do anything. That’s why I believe to have my confidence first,” he said. Rotich won the Lake Biwa Marathon in March and beat Ghebreslassie to win Hamburg last year. Now he’s finished second in a major. There’s only one more step to take — actually winning a major — and his effort today (2:08:53, a solid time on this course) suggests that he’s almost there. Abdi’s run was obviously the big story among American men. Not only was it a great result, but it resuscitated a career that had stalled in recent years. Abdi was 3rd at the Olympic Trials in 2012, but he dropped out at the Olympics and was just 16th in Boston in 2014, his only other marathon since 2012. After missing this year’s Olympic Trials with a calf injury, it would have been easy for the four-time Olympian to call it a career, but he went all-in on New York, which proved to be a great decision. “I was treating this as the Olympic Trials for me,” Abdirahman said. If Abdi had been able to make the Olympics this year he would have been the first American male track athlete to make five Olympic teams. Today’s finish was Abdirahman’s career best at an Abbott World Marathon Major. His previous best major finish was 4th in Chicago in 2006 (2:08:56) and his previous best New York finish was fifth in 2005 (2:11:24). By placing third, Abdi tied his best finish in any marathon as he was third at the 2012 Olympic Trials (2:09:47). More: Abdi Abdirahman 3rd in NYC in 2:11:23 at 39 years of age! We caught up with the youthful looking 30-year old, who runs for the Konica Minolta team in Japan, after the race. He came in with one career marathon finish to his name – a 2:11:48 third place showing at the 2015 Beppu-Ōita Marathon – and today was able to basically match that same time (he ran 2:11:49) on the difficult New York course. Yamamoto was happy to have finished 4th as he said his goal coming in was to crack the top 8. When we asked Yamamoto how he did in the multiple Olympic marathon tryout races in 2015 and 2016, he surprised us by saying he didn’t race in any of them. 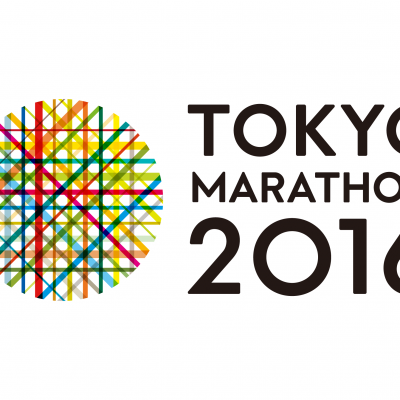 Next up for Yamamoto is theAll-Japan Men’s Corporate Ekiden Championship – the most important Ekiden for Japanese pros – on January 1. When we asked Yamamoto’s interpreter if he’d have time to recover for that race, he told us of course – he has to do it. Yamamoto’s track PBs are 13:45 (2010) and 27:55 (2015). Abdirahman, Yamamoto and several others gapped Biwott at halfway and he was 22 seconds behind them at 25k. 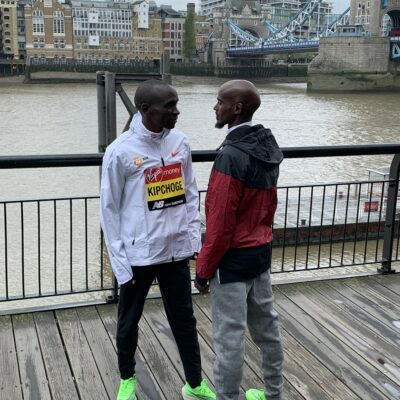 But he caught them by 30k, and after the race he said that he felt he closed the gap too quickly (he went 4:59-4:56 for miles 17 and 18), which hurt him in the latter stages of the race. 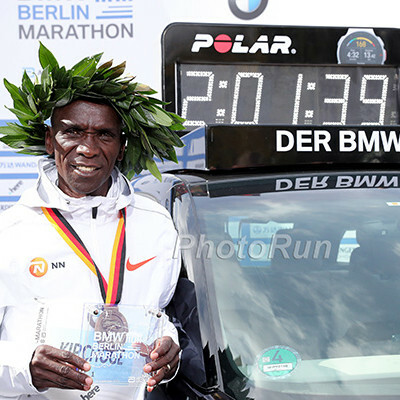 Biwott would have liked to have been third, but he still called today the best marathon he’s ever run. After the race, Stanley Biwott, who dropped out around 15k, issued a statement saying he developed a calf problem three weeks ago that made him realize today at 15km that he’d be unable to finish. On the international race broadcast, Larry Rawson said that all together had missed close to a month of training leading up to this race. Ritz issued a statement after the race that he had battled a heel problem in his buildup, and that’s what caused him to drop out today at 30k. 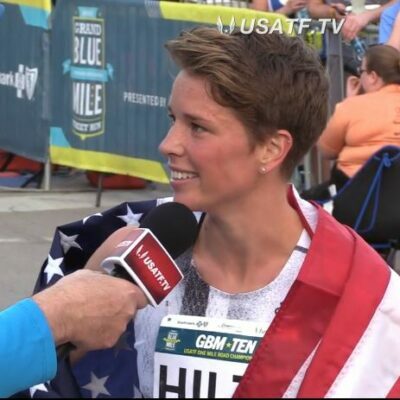 That’s now two straight DNFs for Ritz after he dropped out of the Olympic Trials in February…Ryan Vail was also among the notable names not to finish as he stopped after 17 miles. Matt Llano finished (17th, 2:20:15), but struggled mightily on the way home, running his last three miles in over 6:00…Tyler Pennel was the top American-born finisher in 8th using a patient approach. He ran with the leaders early but dropped back at four miles, running together with Jon Grey until 16 miles as they gradually climbed their way up the field. Pennel’s coach, Pete Rea, said before the race that the key for him to run well today was to be patient, and it’s safe to say Pennel accomplished that goal. 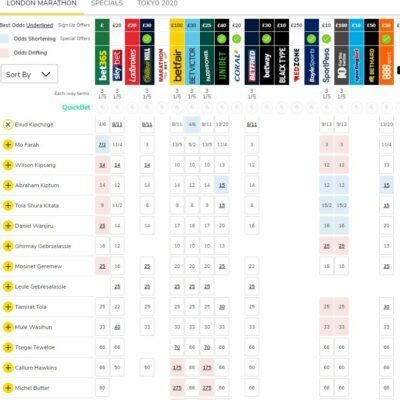 Live blow by blow of race here.